OKLAHOMA CITY – I really like Bible translations. And I really like languages. So, I decided to combine my loves and get Bible translations in other languages!! Of course, I can get all the translations I want on the YouVersion Bible app, but seriously – where’s the fun in that?? I only have two languages right now. The first is in Spanish, the Reina-Valera 1960 translation. NOTE: I’m waiting for the Trinitarian Bible Society’s revision of the RVR 1909 to drop and then I’ll probably get one of those, too. The other, if you haven’t guessed from the title of this article, is in Manx!! 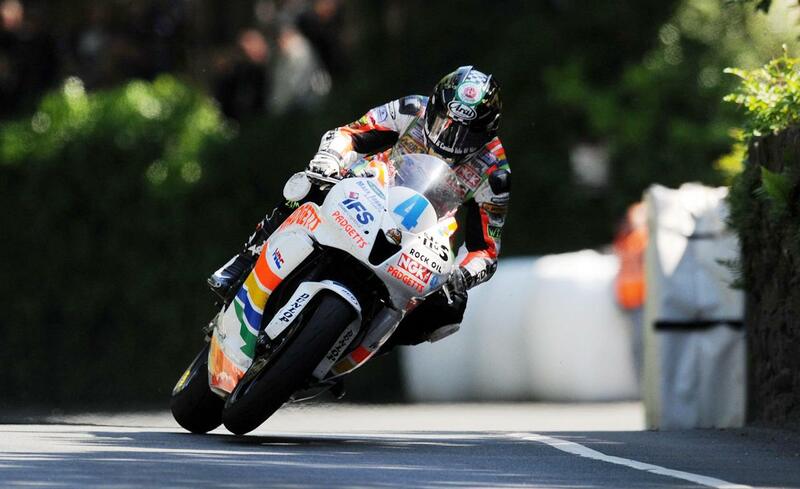 The Isle of Man is known internationally for the Isle of Man TT. 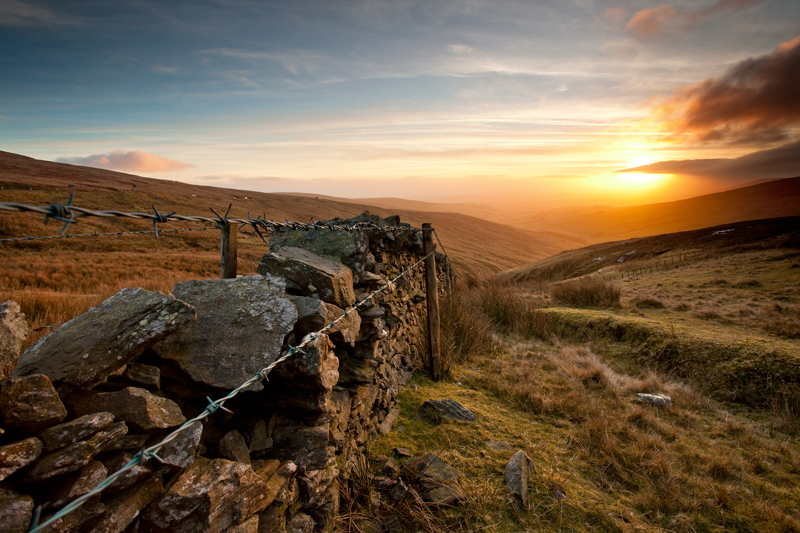 Manx is the language spoken on the Isle of Man, a small island located between Great Britain and Ireland. It is part of the Gaelic family, so it has a passing affiliation with Irish and Scottish Gaelic. As with many minor languages, Manx is not spoken nearly as broadly as in yesteryear. 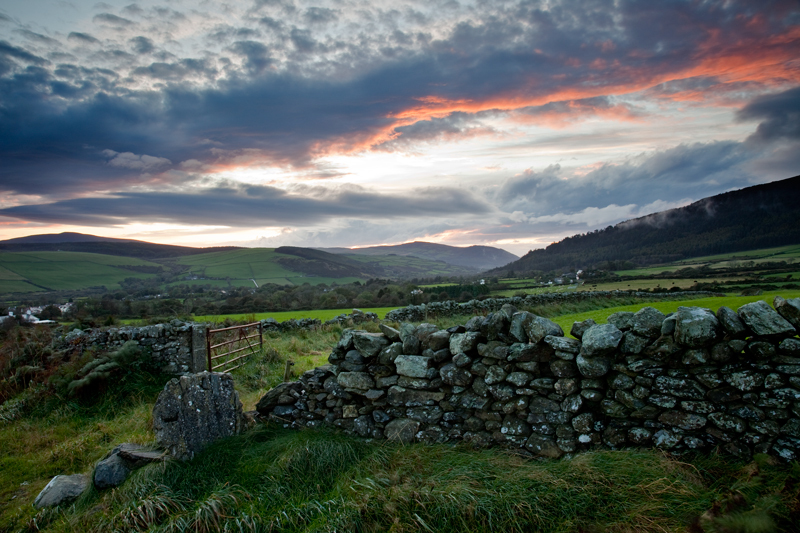 Forsooth, from the 14th-18th centuries, Manx was the de facto language of the island. However, due to the influence of neighboring England, most speakers switched to the socially and professionally beneficial English, leading Manx to decline sharply in the 1800s until today, when it is completely dead as a first language. It is interesting to note, though, that Manx is making a comeback. 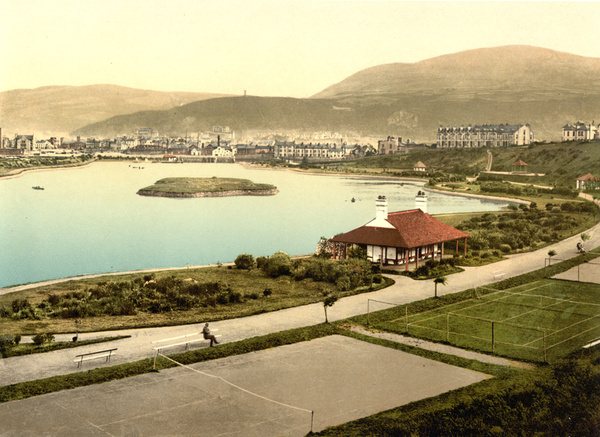 The Isle of Man now features a language immersion school where students learn exclusively in Manx, and with several recordings available of native speakers, the language has a good chance of coming back from the brink. 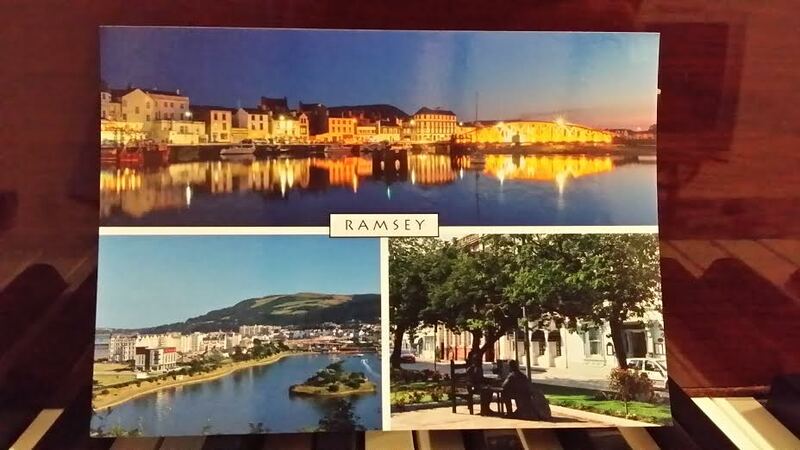 An early photo of Ramsey, the town from which my Bible was shipped. One other factor that will help Manx survive is the healthy written artifacts, none more significant than the ENTIRE Bible in Manx. Hard as it may be to believe, in the 1700s, most of the island’s population didn’t speak or read English. Thus, Bishop Mark Hildesley, himself not a native speaker, organized an effort to provide the Holy Writ in the peoples’ language. Building upon work already started by Thomas Wilson, Hildesley was able to crank out the whole project in roughly a decade, in the process providing the Word for the salvation of people and the words for the salvation of a language. 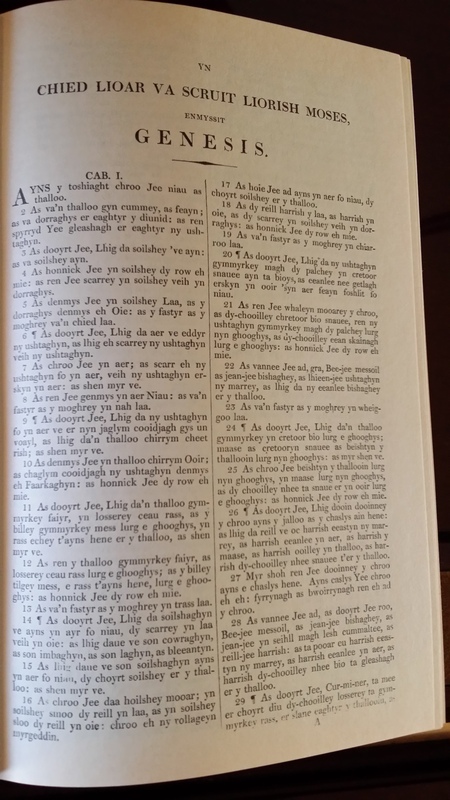 The last version of the Manx Bible was published in 1819. 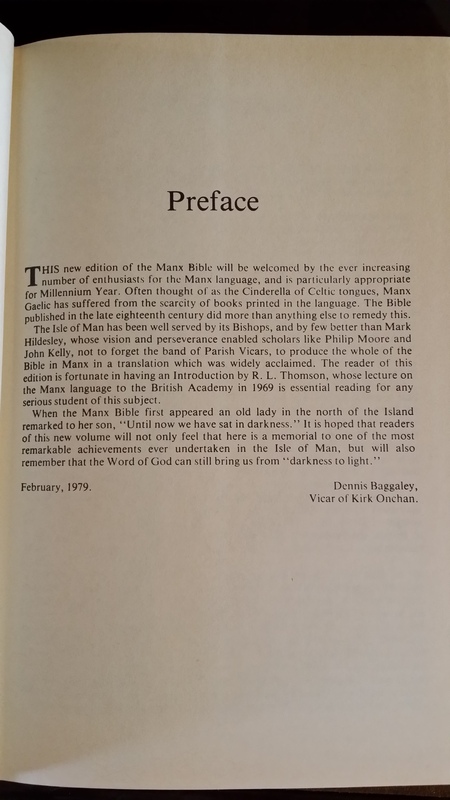 Since, then, the Bible has been largely unavailable except for the Manx Family Bible published in the 1970s, itself a work commemorating the original project. 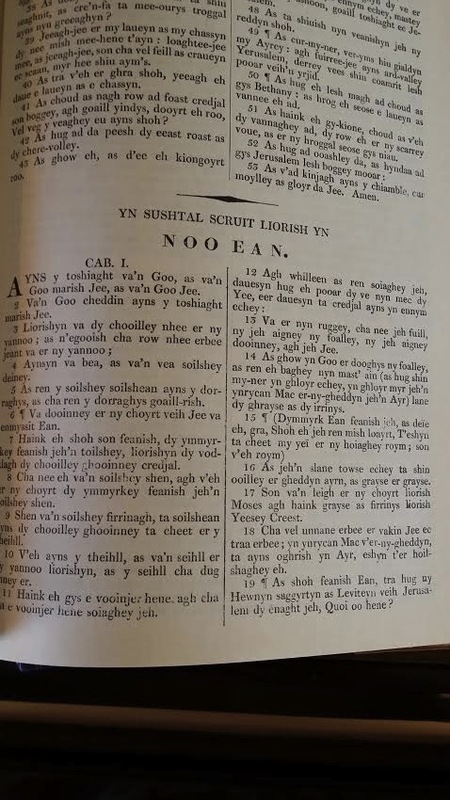 So, even though Manx isn’t a super useful language, I am still very happy that last week I received my very own copy of the entire Bible in Manx. Can I read it? No, not really. But, to me, it is more than just another translation – it’s a reminder of the importance of building bridges and doing anything possible to spread the truth, no matter how small the returns might appear. But seriously, I’m fixing* to start learning this tongue forthwith. 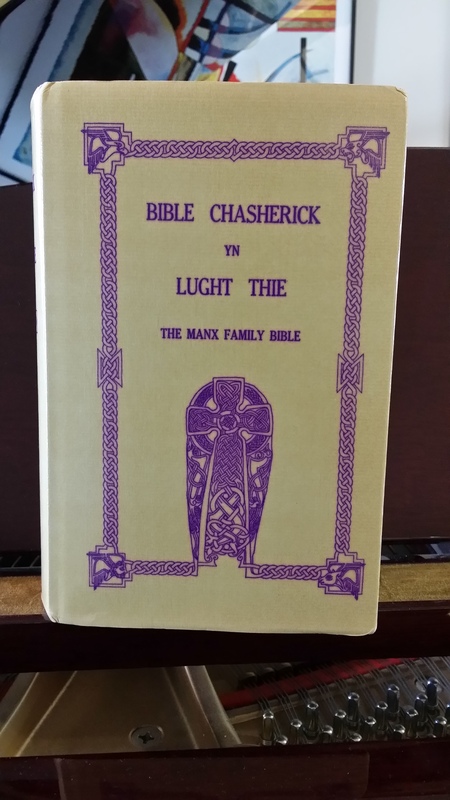 Manx Bible complete with sweet cover art! The spine of the Manx Family Bile with more sweet art! No dust cover!! Oh noooo!! So much dust!!! 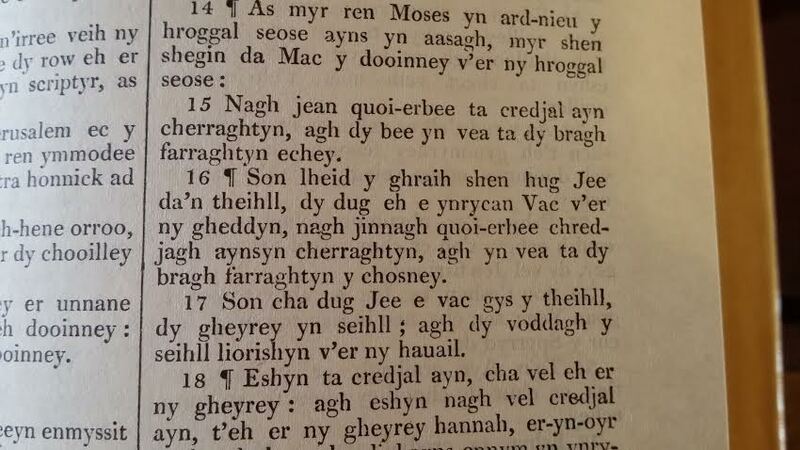 Popular Bible verse John 3.16 in Manx!!! The Preface in Man- uh, in boring old English. 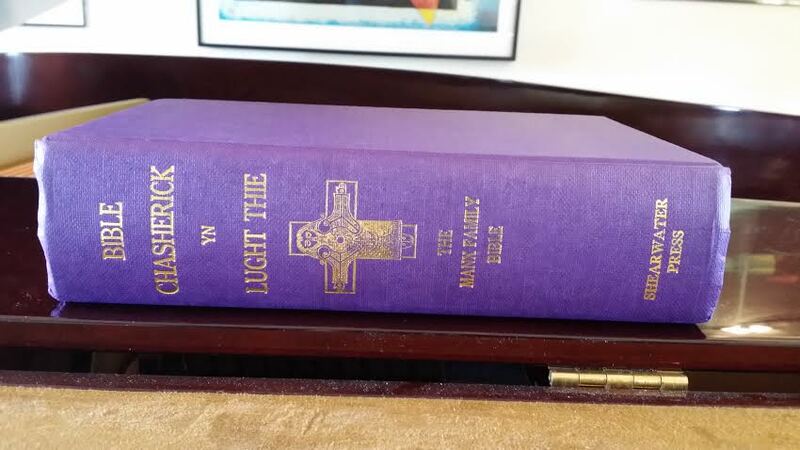 One last thing – the process of getting this Bible was pretty simple, but neat. I wasn’t sure about purchasing a copy on Amazon where I couldn’t see the product, and I couldn’t find a copy on eBay. 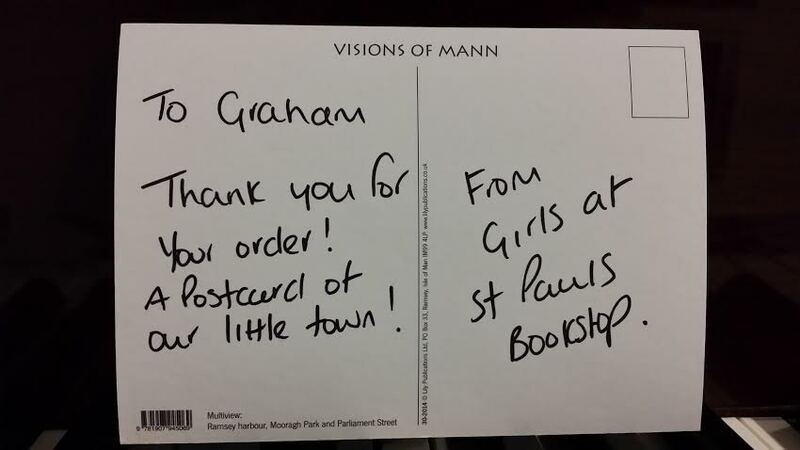 So, I looked up bookstores on the Isle of Man and found one called St. Paul’s Book Shop in Ramsey. I decided to see if they had a Facebook presence, and sure enough they did! I proceeded to reach out regarding purchasing a copy, and eventually someone replied! They don’t keep the Bibles in stock, but I was assured they could get me a copy. They placed the order, and a couple weeks later it came in their inventory. They informed me of its arrival via Facebook, so the last thing was to confirm payment and shipment details. Ramsey on the Isle of Man!!!!! * – I really, really love Texas slang. 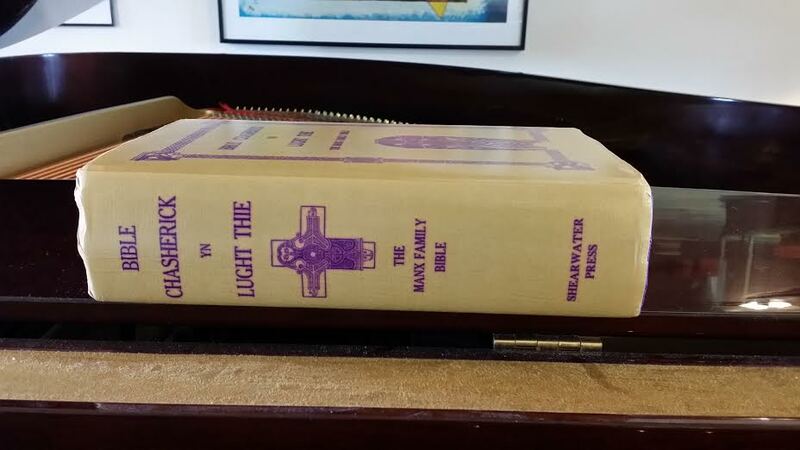 Hi Tom, unfortunately, I don’t know anyone else who owns a Manx Bible in the States. Do you know if it’s the same version as mine?